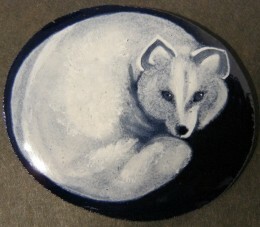 Here are some of the other grisaille spirit animals I am working on with painted enamel. I took these images from photographs. As I try to explore this new technique I want to try a lot of different approaches. 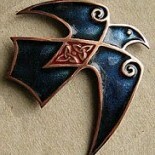 But, being who I am, I wanted it to be related to mythology in some way. In Celtic lore – the otherwolrdly animal was always a white animal – and their were certain animals more likely than others to have supernatural associations. Selkies are mythological creatures found in Faroese, Icelandic, Irish, and Scottish folklore. Selkies are said to live as seals in the sea but shed their skin to become human on land. 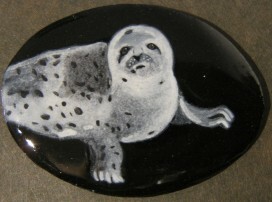 Stories concerning selkies are generally romantic tragedies. Sometimes the human will not know that their lover is a selkie, and wakes to find them gone. In other stories the human will hide the selkie’s skin, thus preventing it from returning to its seal form. Spirit fox. There are many stories showing the cunning of the Fox, not always to its credit, but it should be remembered that ‘cunning’ comes from kenning, meaning ‘to know’, without necessarily carrying slyness. This is the fox’s great secret. In folklore all over the world it’s described as “sly”, “clever”, and “cunning” – and it is. It’s clever at adapting so that it assimilates into its environment even when this environment is changing rapidly. In common with the otter, the fox is said to carry a magical pearl, which brings good luck to whoever finds it. Greetings Catherine, Love your work! And I’ve given you the Kreativ Blogger award on my blog. 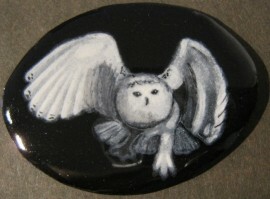 This entry was posted on February 19, 2009 by imagocorvi in grisaille and tagged art, design, enamel, fine craft, fox, grisaille, inspiration, owl, seal, selkie.